The bathroom is the one room that should feel relaxing, indulgent and calm. If you’re a family home, sometimes the bathroom can become overrun with plastic ducks and bath paint (oh the horrors!) and we don’t always have a big budget to spend on the decor. There are ways to create a luxury bathroom without spending a fortune, so here are a few top tips, and great products you can use to update your current space. Think carefully about the colours you use in your luxury bathroom. If you want a boutique hotel feel, then go for simple whites and creams, adding some dark wood, or copper coloured accessories. If you want something more vibrant, think about adding in some graphic designs or geometric prints. Don’t overpower the room with a complex scheme though, 2 main colours should be adequate to keep it looking elegant. If you’re having to replace your bathroom suite why not look around for a good value Whirlpool bath? It’s a great way to give your bathroom that boutique hotel feel and, if you can get one in the sale, they can be the same price as a standard bath. Imagine relaxing in the bubbles of a whirlpool bath after a long, tiring day. Adding clever, well thought out lighting is an easy way to make you bathroom feel more luxurious. Spotlights, wall lights and illuminated bathroom mirrors or cabinets will always add that decadent touch, and give your design a more professional feel. It’s best to add this element of the room when you’re at the early stages of decorating so do give the whole scheme plenty of thought before you start. Adding extra luxurious accessories into the bathroom is the easiest and most cost-effective way of adding some luxury. Think of things like Diptyque candles, gorgeous fluffy towels, and divine soaps and fragrances will all add a decadent touch to any bathroom, whether you’re decorating it or not. 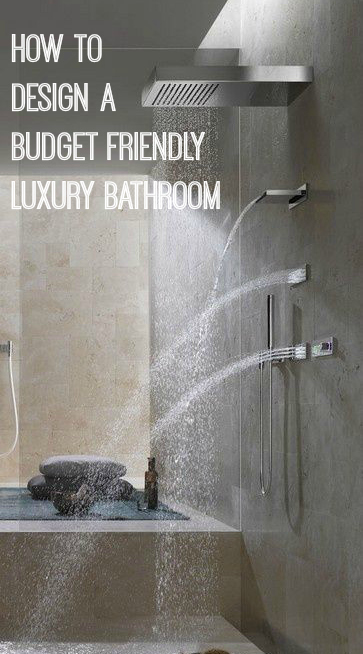 Check out sites like Joss and Main or Amara Living for some good value luxury bathroom accessories. Alternatively you could download my shopping guide listing out all the best brands and companies to browse when updating your home and your bathroom. It’s completely free with links and price range guidance too. You can get your hands on it HERE. Another incredibly easy way to give your bathroom a luxury feel, is to clear away all the clutter. We all tend to accumulate a collection of bath and shower products so having some stylish, clever storage to hide them all away is the perfect way to give your bathroom that hotel feel. Decant your favourites into coordinated containers, and add a storage unit, hooks and cabinets to ensure all your products are hidden away from view until you need them. These are all really easy, inexpensive ways to help you design and create your luxury bathroom. Do you have any other ideas? Seemed fantastic designs and tempting to purchase if it will cost as ordinary bathroom? ?